This education resource was produced for the exhibition Landmarks, featuring works from the John Kaldor Family Collection at the Art Gallery of New South Wales. It presents text from the exhibition along with questions and activities for students in Years K–12. Click on an AGNSW collection image for more information and to view the work in the Gallery collection. The John Kaldor Family Collection comprises over 200 artworks and is among the most significant donations of 20th and 21st century art to have been made to an Australian art museum. The collection was initiated by John Kaldor AM more than 50 years ago and since the 1990s it has been developed in collaboration with Naomi Milgrom AO. Today, the collection is renowned for its in-depth representation of some of the world’s most influential artists. The Art Gallery of NSW touring exhibition Landmarks is on display 21 January – 19 March 2017 at the Blue Mountains Cultural Centre; 9 June – 13 August 2017 at Tamworth Regional Gallery; and 29 September – 3 December 2017 at Murray Art Museum Albury. 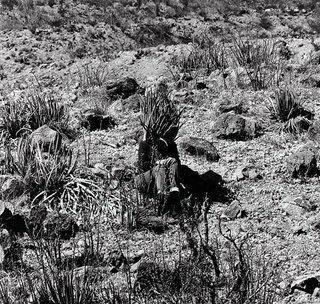 Richard Long is very interested in nature and the landscape. He is especially known for his long walks in remote parts of the world and uses these as his inspiration. Create a PowerPoint of his sculptures and the locations of his walks throughout the world. Compare how different environments impact on the art he produces. The artist Christo, and his partner Jeanne-Claude, are well-known for wrapping things – from objects to buildings and even the coastline of Little Bay in Sydney in 1969. The idea of wrapping something makes it more mysterious and we have to guess what is inside. Find out more about how they wrapped Little Bay and how many people helped. In the exhibition, find the model of the Little Bay project and more examples of things Christo wrapped. What do you think is inside the wrapping? Journey through your local environment and document features by sketching and photographing your walk. Collect leaves, pebbles and other natural objects as you go. Create a sculpture that ‘describes’ your journey. What conceptual practices and materials are evident in this exhibition? Do they differ to traditional approaches? Argue your point of view, referencing artists in this exhibition as well as those from other periods in art history. How do the artworks in this exhibition challenge the audience? What do you think audiences expect from art today? What is expected of the audiences themselves? Choose an artist from this exhibition who inspires you. Write a subjective response to their work, describing the feelings it evokes in you and the specific elements that provoke this reaction. Write a critique of their work and discuss the relevance of their art practice in today’s world. Create a collaborative installation, a site-specific artwork or a conceptual artwork, showing influences from one of the artists in this exhibition. Invite other students to experience the work. Record and document their response. How do their responses compare with your initial thoughts? Christo Javacheff (Christo) is known, with his life and work partner Jeanne-Claude (1935–2009), for ‘wrapping’ public monuments, buildings and features of the landscape as well as his own projects wrapping smaller objects. 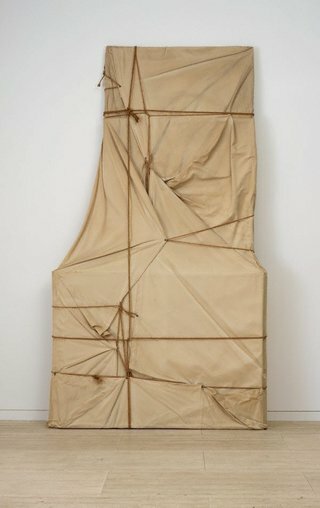 He began this technique – which recalls drapery from classical sculpture and painting – in the late 1950s. Whether small or almost unimaginably large, these everyday pieces of the world when veiled become unfamiliar, mysterious, magical. Christo began working with the landscape as a student employed to beautify the landscape of his native Bulgaria as seen from the Orient Express. He later moved to Paris and associated with Nouveau Réalisme, a group of artists who used found materials and responded to everyday situations in their work. Christo’s ambition for larger projects was established when he moved to New York in 1964 with Jeanne-Claude. In 1960 John Kaldor invited Christo to Australia, a visit which resulted in Wrapped Coast, One Million Square Feet, Little Bay, Sydney, Australia 1968-69, Christo and Jeanne-Claude’s first major environmental work and one of the most ambitious land-art events in the world at the time. 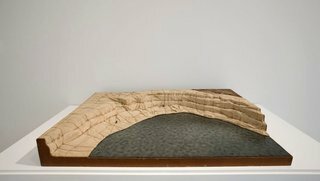 This is the model for the inaugural Kaldor Public Art Project, Wrapped Coast, One Million Square Feet, Little Bay, Sydney, Australia 1968-69. In 1969, Christo and Jeanne-Claude directed a team of mountain climbers, workers and volunteers in wrapping 2.5 kilometres of Sydney coastline with more than 90,000 square metres of fabric. It was not only the first Kaldor Public Art Project but one of the most important early environmental or land-art works anywhere in the world and the largest single artwork that had ever been made – although it was initially conceived to be even bigger. This maquette was designed to give an impression of what the project would look like. 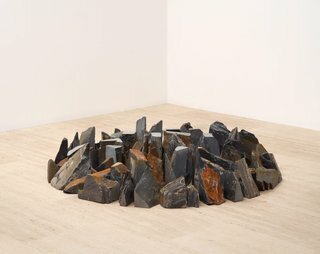 One of a generation of British artists who redefined traditional approaches to sculpture during the 1960s, Richard Long is associated with the development of land art. He has created environmental sculptures as a result of long, rural walks in many parts of the world. Along with producing installations of natural materials in their original environments, which are later presented as photographs, Long collects materials to form sculptures within a gallery and produces written texts, maps or drawings as remnants of his experiences. He participated in a Kaldor Public Art Project in 1977, which included making site-specific works for the Art Gallery of NSW. Long often makes circles using stone or wood and these are sometimes associated with Megalithic stone circles in the English countryside. In the case of Circle in Africa perhaps it is more likely related to the thorny circles bush pastoralists make as temporary protection for their cattle. In this photograph Long has documented a circle he made on a walk by simply rearranging twigs, which he found at the site. Long makes most of his work while walking in the landscape, sometimes making interventions by moving objects to create a kind of geometry. John Kaldor first asked Long to create a project in Australia in the early 1970s. In 1976, the year in which Long represented Britain in the 37th Venice Biennale, he finally agreed to make new works in Sydney and Melbourne the following year. He also proposed making a work outside the gallery spaces. A hundred mile walk along a straight line in Australia was part of a body of work exploring the same principle in different regions. The destination for the walk was unplanned and uncharted, the location chosen intuitively by the artist. Long spent eight days and nights in the dusty bushland outside Broken Hill. Using a compass, he walked out and back each day in a straight line, returning each night to the same campsite, for a total of 160 kilometres (100 miles). 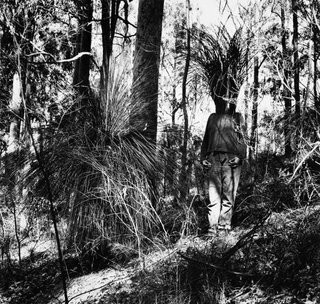 A hundred mile walk along a straight line in Australia from this project was recently shown in Long's retrospective exhibition at the Tate Modern in London. British sculptor and land artist Andy Goldsworthy works with the natural landscape producing site-specific sculptures and installations. He has worked in locations as diverse as the North Pole, the Lake District in England, the Australian desert and Dumfriesshire in southwest Scotland, where he has lived since 1986. His works are reliant on the environment and weather and he brings nothing with him to a location, using only natural and found objects. 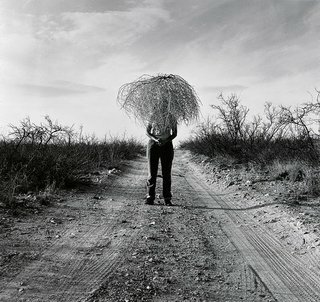 As his works are mostly ephemeral, photography plays an important role documenting their transient state. Goldsworthy has said: ‘Each work grows, stays, decays – integral parts of a cycle which the photograph shows at its heights, marking the moment when the work is most alive. There is an intensity about a work at its peak that I hope is expressed in the image. Process and decay are implicit.’ In the case of Leaf throws, Blairgowerie, Perthshire, Tayside, 3 January 1989, the artist has not carefully placed objects in the landscape but captured a moment when in collaboration with nature he consigns the leaves to the wind. 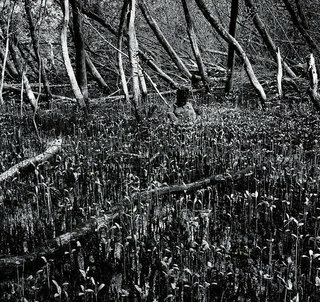 Simryn Gill often bases her photographs on the landscape including her native Malaysian forests. She also inserts references to colonial interventions, including paper torn from texts and rolled up so they can be inserted into the vegetation. 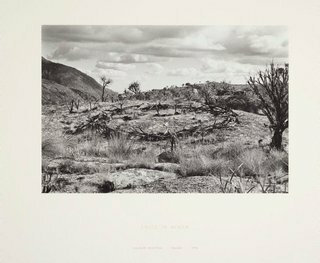 These particular prints in Vegetation are the large version of this series, exhibited at the Asia Pacific Triennial in 1999. They are similar in scale to her 1996-98 series Forest and have the same beautifully modulated tones of black through white. They also share the same sense of an immersive, enveloping landscape. 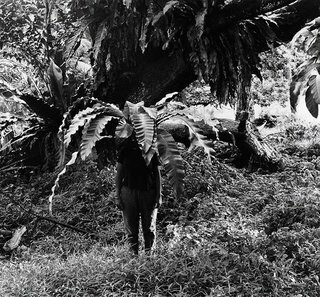 In these works which were begun at a residency at Artpace in Texas, Gill begins the process of masking and disguising, of naturalising human figures into the landscape (in this case herself) through obscuring their heads with fruit and vegetation, which was to be so important in her later bodies of work such as A small town at the turn of the century. The work is at once humorous and at the same time a critical reference to the self-effacement associated with dispossession and displacement in the postcolonial world.